Part 2 of a 2 part reply by a IWW member, to 'Direct Unionism: A Discussion Paper', which argues for a network of militants and non-contractual organizing. In the Direct Unionist piece, it is split up into three parts. The first part of my response focused on the first part, which mainly concentrates on linking the conception of direct unionism to the IWW's Organizer 101 Training, while giving examples, both historical and contemporary, of groups and organizations which practiced something similar to the conception outlined. The second and third parts get more in depth into considering contracts with employers. Before taking up what the piece has to say, it's worth looking at the subject of contracts within the early IWW. This misconception results from the fact that during the early years of the IWW, union contracts had no legal force in the United States of America. In fact, union contracts did not become federally protected agreements until the passing of the National Labor Relations Act in 1937. Prior to that, many union contracts were attempts by the employing class to limit economic direct action and class based solidarity by unions. This is a bit dishonest though. Contracts always include attempts to 'limit economic direct action and class based solidarity by unions'. A contract is a written agreement that affected parties attempt to get what they want out of it. By the nature of class struggle, employers want uninterrupted production. U.S. labor law hasn't changed this. Later in the mytch section, it quotes from Fred Thompson's book2that 'Originally the IWW had put no restrictions, except requiring GEB approval'. However, Philip Foner3 describes in 1912, a local in Montana which had its charter revoked over signing a contract. The 1932 constitution4 does state all contracts required GEB approval, and also prohibited contracts that were for specified amounts of time or required notice from workers before making demands on wages, hours or shop conditions. It is against the principles of the I.W.W. to sign contracts with employers. When workers sign an agreement not to strike, they sign away the only weapon they possess. Past experience has shown that employers only respect contracts so long as the workers have power to enforce them. When the workers have such power, contracts are unnecessary. When they lack power, contracts are useless, for the employers break them whenever it suits their purpose. . . . So it's probably safe to say, that while the early IWW didn't explicitly forbid contracts, it structured their acceptance in a way which would be difficult, while seemingly seeing them as undesirable. Why this changed is outside my scope, but it probably had a lot to do with the combination of declining numbers and, at the time, new labor laws such as the National Labor Relations Act ('Wagner Act') of 1935. While it is certainly interesting to take a look at the past and see how IWWers handled the question of contracts, it's 2011, not 1911. We shouldn't let the ghosts of the past determine what we do in the present, otherwise we'll have no future. We note here that in the countries where the IWW is most active—and especially in the US—union density and active organizing has been on the wane for decades. Ironically, this opens up a space for IWWs to present our ideas of unionization to those who may have very little understanding of what a union is and how they are ‘supposed’ to function. In fact, in many instances, IWW organizers may inadvertently give the impetus to a contract campaign by presenting the differences between “us” as the IWW and “them,” the business unions. 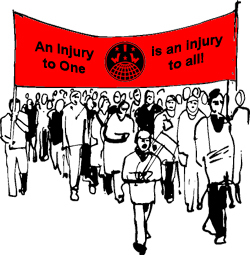 If IWW methods falter, workers then look to other, contractual, options. This is mostly correct. The space opened up by declining union density means most workers will only be vaguely familiar with how a union operates, some may not even have this vagueness. So we have a chance to do that defining, and operate in a somewhat ideal way. But I think the reason the piece attributes contract campaigns being taken on (listing differences between us and the mainstream unions, workers wanting 'stabilized' gains) is missing something. I think what probably happens just as much, is that the IWW's radical outlook is downplayed and it is 'marketed' as basically a more militant version of an AFL-CIO union or just a smaller UE. The importance of the preamble gets minimized and the language of the mainstream labor movement is adopted. There are a variety of understandable reasons for this. Among them being a history of red-baiting in the U.S. that can't be paralleled with anywhere else, a tendency for populism inherited from the left, and fear of alienating or scaring co-workers away. Another reason worth exploring is the quite conservative way mainstream unions are, which leads to those with experience in these unions looking at the IWW as appealing. But the appeal is sometimes merely for something more militant than the mainstream unions, which covers a lot of ground, much of it not an area the IWW should be covering. It's something we shouldn't try to do and is, in my opinion, a significant factor in why contract campaigns are chosen in some organizing committees. First, let it be said that by encouraging a non-contractual organizing strategy we are, in many ways, putting the building of class power before the protection of bread-and-butter gains. This is important. We aren't merely trying to improve our conditions, we are trying to also, eliminate these conditions. If an organizing campaign wins higher wages but does not develop our co-workers skills and knowledge, we have failed, overall. We need both and when we organize, we need to consider how what we do will determine both. The piece describes two shops with campaigns. One won, but lost nearly all its committed organizers. The other lost but gained committed organizers. A win doesn't necessarily mean that our capacity is increased. A loss doesn't necessarily mean disillusion and people drifting away. It's how the campaign is organized that determines these. Let's take the 'no strike clause'. In my opinion, no union, much less a self-professed revolutionary one, should ever agree to this. It is basically a set of handcuffs that restricts our greatest power, the power to disrupt. Yet, this is one of the first things an employer wants in a contract. In fact, it is an already assumed and understood aspect of contract negotiations. 'Management rights' is the same thing. It acknowledges the employer's right on the speed and pace of work and many other workplace issues. If there is a dispute on what these issues are, the way for addressing this (since strike or work stoppages are off the table) would then be 'binding grievance procedures', a disempowering process that leaves your issue in the hands of a steward and member of management. All 3 of these things, which are usually things every employer wants in the contracts, take away our power or individualize our issues, when we should be building our power and collectivizing our issues. Direct unionism, very purposefully, brings up the question of what exactly the role of the IWW is. Are we just a militant, democratic union? Or are we a militant, democratic, revolutionary anti-capitalist union? And how do our campaigns, strategies, and decisions reflect this? We are small, no doubt about it. But we have always and continue to punch way above our weight. It is time we recognize this and the tactics that make this possible. Part of this is recognizing that contracts may be something that works against our goals, not towards them. 2. The IWW - Its First Fifty Years, Fred Thompson, pp. 45-6. Thanks for the good piece Juan. There's some issues with what you were saying about contracts that are important. If we look at the three things to reject in contracts, it's important to understand that we will never get an employer to sign such a thing. You'd have to be crazy to sign an agreement that doesn't recognize you're unilaterla right to make management decisions in which the workers could break production at any time and where you have no additional recourse in grievance disputes. I think in every case the employer would settle the issues without signing a contract since it would entail additional rights not worth giving up. In that way, those contracts are a utopian idea in the IWW. It would take a level of struggle so high that if you achieved it, you wouldn't need a contract in the first place. Years ago the CAW tried to get rid of no strike clauses militantly in a big struggle and failed, I have no faith the IWW would do any better. The dynamics of this (that you need high level of struggle for such contacts, and most contract campaigns start from positions of weakness due to populist pandering) push people towards populist business unionism with red flags. You shoot for the good contract but settle for a democratic one. there's exceptions in exceptionally liberal small businesses, but by and large all the experiments in contractualism in the IWW have moved in this direction, except it should be noted where IWW workers under contracts came out against their own contracts! Up till the 30s the IWW constitution had a couple clauses (changing)regarding contracts, basically they barred having a time period (they were temporary short term agreements only), they barred various relations with management, and barred things against the spirit of the iww. In essence it made getting a contract impossible. Early on lik 1907 someone got a contract and they were thrown out of the union. There were contracts in the 40s, but it was a rare thing. The first no-strike clause signed however was in Boston ironically led by an organizing team of IWA supporting anarchosyndicalists in the IWW, and then spread to Portland via someone who was expelled from the union for trying to mine IWW members to business unions to get a job. (c) Any agreement wherein it is specified that the members shall work only for employers who belong to an association of the employers. This appears in the October 2011 issue of the Industrial Worker, along with a 'counterpoint' to both part of my review and the Direct Unionism piece itself. This, and Sean G's response were reposted on Recomposition. Thought I'd repost some comments from there. I’m not moved by Sean G’s response, having been active organizing and as a steward in two business unions and having worked on organizing with the IWW. Contracts don’t get you much. What they do get you, you usually have to work so hard for, they end up being like demands, rather than reality anyhow. It’d be better to cut out the lawyers (at least there) and just make demands and win them. And I can see how that’s true. It’s not whether or not you win today – the contract is better for that – it’s whether or not you keep on fighting and winning. Contract-based servicing doesn’t develop the fighting capacity that can take us further. The security argument also doesn’t hold up. I have seen first-hand that a contract doesn’t offer security – you have to build an organization that can fight to make it a living document. The contract only offers the protections you fight for, so again, you might as well just fight concessions outright, rather than fight to enforce the contract. Conditions are unlikely to fall due to a planned avoidance of contract negotiation – they fall when the union is broken by the employer, which, of course, also ends the contract bargaining process. We have to avoid legalism and remember that just because it’s the same legal situation (no contract), that doesn’t make it the same practical situation (bad conditions). The theory/practice argument points against Sean G’s position, generally, that the union should pursue contracts, even if it seems to support renewing them where they exist. The practice of making deals with bosses informs workers’ consciousness and supports a theory of class truce or partnership. Once that is in place and has established it’s own form of consciousness, what practice will push workers’ power further? It’s only by abandoning contracts that such people could get back on the social revolutionary path they were on when they changed their social relations by organizing themselves. So the argument that we have to prioritize conditions over theories means we have a responsibility to avoid creating conditions which will paralyse our movement. If we prioritize action and want theory that supports it, we have to recognize that it is not a point of theoretic purity to stand against contracts, but a point of strategy for a revolutionary union. The strategic reality is that ‘the material reality’ of a smaller, more militantly organized branch in the Bay Area may carry forward the union’s mission better than a larger, unfocused branch. This is a real question we need to consider. It’s not enough to say “numbers would fall” – we need to assess that strategically and consider what the strategic implication of that would be and how building workers’ power would make up for that over the middle and long term. As a union, victory in the class war is the only metric we can accept without reservation. Other metrics, like numbers of workers and shops and the value of concessions won, we need to consider in relation to our strategic progress, not for their own sake. None of this new on Recomposition, I’m sure, but I thought I’d gather up here some thoughts I’ve had while reading DU and these responses. I think the worst part of Sean G’s reply is the assumption that ‘direct unionists’ would suggest as a basic strategy dropping contracts outright in places where the IWW has had them in place. This is a major strawman. I would argue that while recognizing the distasteful reality that there is contracts within the IWW at the moment, I don’t believe that direct unionists would argue for completely abandoning the current CBA’s in place outright. Instead, as FW Jaun says, we “…should building class power and developing our co-workers’ organizing skills and commitment” as well as confidence as a revolutionary union. That is, organizing and strengething the power on the shop floor of the workers, and remove the illusion of the ‘power’ of the contract. Has the Bay Area branch ever held ‘organizer training 101’ and ‘training for trainers 101’ for these shops? Sean G states that “the reality in the Bay Area is that if the branch decided not to renew the contracts, their working conditions would quickly deteriorate and our branch would shrink dramatically”. Without insulting the good hard work that the Bay Area people have done, how big is the Bay Area branch in reality? Do workers from the 3 contract shops attend branch meetings? Are delegates from the shops elected from the shop floor (I know for a fact that the union delegate for the binside CBA is a retiered carpenter, not a worker on the shop floor)? Are there shop committees and do they meet often? I would suspect that, despite its large paper membership under CBAs, the actual size of the Bay Area branch is just as small as any other branch of the IWW. In essence, the Bay Area branch of the IWW is acting as a service union, and as such I figure the strategies of revolutionary unionists should be not dissimilar to the strategies within the business unions (not the same, of course, but not dissimilar). The goal is to be building the kind of skills, confidence and understanding within our fellow workers need for a union based on revolutionary, direct action unionism. Of course, I don’t see any shift of strategy or tactics coming from the Bay Area branch considering it’s current poltical disfunctionality. As I'm not a Wob, I won't comment on the IWW aspect of this. Seems mostly internal to the IWW. I am always struck by this position though: "The practice of making deals with bosses informs workers’ consciousness and supports a theory of class truce or partnership." Except for an all out struggle, compromises and truces are hammered out daily on the shopfloor. Even the settlement of most militant strikes have elements of compromise and immediate truces (except the "general strike for industrial freedom"). I would suggest that there is a parsing of events which occur in struggles. And the struggle around certain immeidate issues on the shopfloor or office and the larger struggles and so forth discussed in the article.